“Have you heard that Szeged was bombarded?” Stevan Deneberg asked his wife, Hilda, visibly concerned. Hilda, nee Hauser, responded by hugging her two sons closer. Mirko, a boy of 11, and Pavle, 8 years old, just looked at their speechless, grief-stricken mother. Szeged was close to Subotica where the Deneberg family lived. World War Two was coming to its end and the German High Command was increasingly strained. Advancing from the East, the Red Army troops were pressing forward to Berlin. Russian troops were spreading out like a lady’s fan across Eastern Europe. It was obvious to a great many that the dream of a Third Reich was collapsing, but no one in Germany had the courage to admit it. Hitler’s plan to eradicate the entire Jewish population had not yet been completed. The millions of dead were still not enough for the Nazi fanatics and, as if in a frenzy, they continued with the obliteration of an innocent people. Unsatisfied with the performance of the Hungarian authorities in solving the Jewish question, German troops occupied their former ally, Hungary, at the beginning of 1944.Up to the German occupation, the Hungarian authorities had protected Jews who lived in large numbers in Budapest and other towns across the country. They considered Subotica – Szabadka as they called it – their own town. Before the war nearly six thousand Jews lived in Subotica. This fact could not escape the attention of the hardened Nazi, Eichmann. Acting on Himmler’s orders, he immediately began solving the Jewish question in Hungary. With the transport of Jews to death camps, mainly Auschwitz, the pogrom was set in motion. The dentist Stevan and his wife, a doctor, both well liked among their community, were now forced to part. Stevan was deported to Bačka Topola and placed in a so-called labour camp, a phrase ironically coined by the Nazis for the last stage before dispatching people to their death. However, Pišta, which was Stevan’s accepted nickname, was in all probability connected with the Resistance movement and managed to make contact with someone who had him transferred back to Subotica hospital, ostensibly for a gall bladder operation. The new occupational authorities banished all Subotica Jews to the recently founded ghetto in no time. It was in the spring month of May 1944 that Paralelna Street became the ghetto. The Deneberg’s house was also in Paralelna Street. 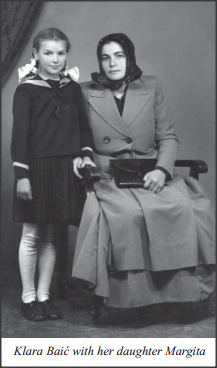 Together with their children, Hilda remained in the ghetto where she awaited deportation to the Auschwitz death camp along with other Jews. Hilda knew nothing of Pišta’s whereabouts up to the moment the Nazis forced him out of the hospital into the ghetto. Thus, the Deneberg family was once again reunited. Janči was spared from the Anti-Jewish Laws. Before the onset of the war, he had married a Catholic. Blaško Rajić, a priest who befriended him, issued a false birth certificate in Janči’s name pronouncing him a born Catholic. It was no big secret that Pišta’s brother was a Jew, but the fake certificate and iron cross, which he had earned on the Eastern Front when he saved a Hungarian officer, were justification enough for him to move around the city freely. There was no time to lose and he acted quickly. He found a cart, piled it with hay, and in no time arrived at the back entry of the ghetto. The conversation with the gate-guard didn’t last long. Janči secretly handed him a bribe. Together with Ruža he entered the ghetto. There was no time to waste and it was clear to Janči right away that he could only take the children out of the ghetto. Even their mother had no time to say goodbye to them. Ruža took the children by their hands and walked briskly to catch up with Janči, who was hastily heading for the back gate. However, there were still problems ahead of them at the gate. The gate-guard would not let them take the children outside. It was Janči’s turn now to remind him of the sum of money he had taken to turn a blind eye. As the guard was adamant, Janči simply waved Ruža on, signaling her to hold on to the children and take them out of the ghetto. “If you say a word about this to anyone, be sure that I will find you and kill you personally,” Janči threatened the guard in a fit of unrestrained fury. They quickly hid the children inside the pile of hay and disappeared from the guard’s sight. Everything was happening so quickly and the children’s uncle had little time to find a safe place for them to stay. There was no way he could take them to his home. He rightfully assumed that once it was established from the deportation list that Hilda’s children were missing, his house would be the first place they would look for them. His friend, a Hungarian lady, was persuaded to take the children in but only till nightfall when her fiancé, a policeman, was due back from work. While Janči was searching for a safe house, the last transport of Jews from Subotica left for Auschwitz. Night was approaching and Janči had yet to find a place for the children. Some friends of his took the children in for two days, giving him time to continue his pursuit round Subotica for another safe house. He heard of a widow of a Jew, herself a non-Jew, who rented rooms. A boy of fourteen was already staying with her. However, the lady had pushed up the price to a rate which the children’s uncle could not afford. She was asking for 200 pengo per child, i.e., 80 dollars for the two of them. Although it was a considerable sum for those times, Janči was left with no alternative but to place the children with her for a few days. It seemed that Lady Luck had not yet abandoned him. Events started to unroll when he came across a house where an exceptionally loquacious woman rented rooms. Janči frowned at the abundance of words flowing from her; however, the children were already well coached to tell no one that they were Jews. “Is this a policed city?” Janči mused, aware that yet another possibility to hide the children had fallen through. To his knowledge there was no place left for him to seek refuge for his brother’s children. It was then that his thoughts finally turned to his old friend, Blaško Rajić, the priest. “Take the children to Klara Baić, a Bunjevka,” he said, giving him the address. At that moment Janči finally realized that the priest must be in liaison with the people from the Resistance movement, men operating undercover and in collaboration with the Partisan forces. On reaching the house, they learned that Klara Baić was not in Subotica. Her house was looked after by a relative called Ester. Hearing the purpose of their visit, she let the children inside to stay and wait for Klara’s return. Klara returned on June 28th, and to her great surprise found two unknown boys living in her house. Janči was soon informed of her return and rushed to the house to talk and plead with her to let the children stay there. “It is out of the question,” Klara Baić protested vehemently. “You’re on the very edge of the town and no one will find them here,” Janči persisted searching for plausible reasons to convince her to let the children stay. Klara let the children remain in her house out of decency, but one could sense the rage pent up inside her. “I’ll pay for the food,” Janči persisted, resolved to leave the children with Klara. When Klara approached the children, the first and only thing she could see was the fear of an uncertain destiny in their eyes. 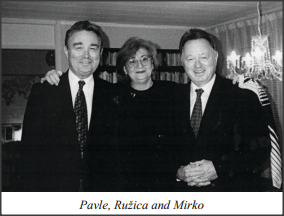 Klara’s daughter Margita was sitting beside Mirko and Pavao. She and Mirko were the same age. Klara looked from one child to the other and, resting her eyes on Margita, sensed the child’s apprehension for her friends as if her own fate was threatened. Whether her motherly instincts had been aroused or something completely different won over, Klara finally decided to let the children stay with her. The priest’s good word may have been decisive for Klara’s humane choice. However, the children’s ordeals were far from over. It was a hard time for both adults and children. Word got round that there were Jews still living in Subotica. The search for Jews who had escaped deportation began. Klara’s home was also searched. By contacting Anica and Ruža, who, like her, were members of the Resistance movement, Ester came to the rescue once again. They hid Mirko and Pavao in the pigsty; this was far from kosher but saved the children from the heartless slayers. During the summer, while the children were playing in the yard, word got round that a search of houses was underway once again. “So Klara has two more children now, hasn’t she?” a soldier asked while searching Klara’s next-door neighbour’s house. From afar he saw Mirko and Pavao enter Klara’s house. The soldier shuddered at the mere mention of Russia and Russians. He never even entered Klara’s house. On Octoder 10th, 1944, the Russians liberated Subotica. There were those who cheered and others less enthusiastic. 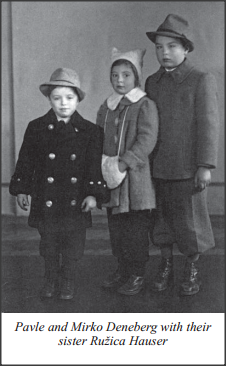 Mirko and Pavao had reason to rejoice a few weeks later when their mother returned from Auschwitz. Although spiritually broken, Hilda’s joy at seeing her healthy and well kept children was unrestrained. She could not find words enough to thank Klara for selflessly saving two innocent lives, those of her children. Copyright © 2014 Jewish Community Subotica.